Whether you’re a seasoned photographer or someone who’s barely touched a camera, Camera+ will make you love taking photos. Set exposure separately from focus. You can now easily control how light or dark your shots come out. 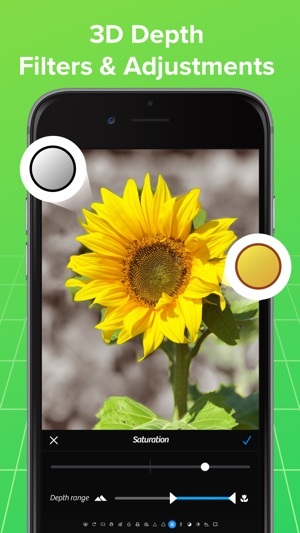 Use the Stabilizer to steady your iPhone and get the sharpest photos you can. There are countless uses for the Timer including taking the highest-quailty self-portraits. 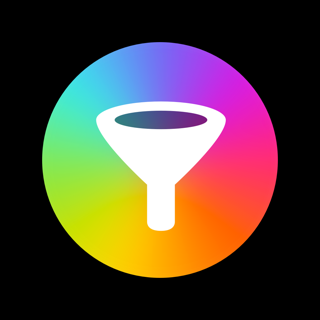 Capture all the action by using Burst to take rapid streams of shots. Up to 6× zoom with advanced digital processing provides you with quality that simply blows away the competition. How many times have you wanted to take a pic of yourself in a dark room but couldn’t. Well, now you can! Use the Horizon Level to eliminate taking crooked shots. Clarity is one of the biggest breakthroughs to happen to image processing in a long time. Clarity analyzes your photos and makes several intelligent adjustments that magically bring out details and breathe life into dull photos. With Clarity, you’ll stop throwing out bad photos… you’ll be amazed to see what it can do to photos that you’d typically consider unusable, like shots that came out too dark. Most modern digital cameras all have scene modes to help you get the best photos for your particular situation. 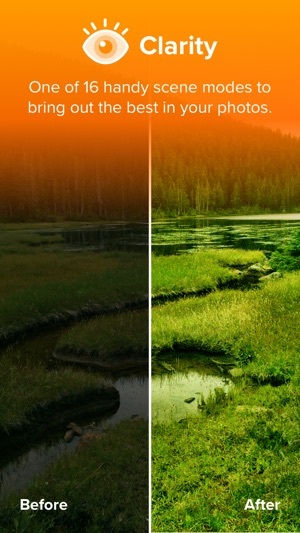 With Camera+, you get to choose from several scene modes including Food, Sunset, Night, Portrait, Beach, and many more. Professional photographer, Lisa Bettany created a slew of stunningly beautiful effects. Make your photos shimmer with “HDR”… get down and dirty with “Grunge”… fill your pics with emotion and despair with “So Emo”. And this is just the tip of the iceberg… there are dozens of 1-touch effects for you to experiment with. All the pics you take in Camera+ go in the innovative Lightbox where you can quickly and easily skim through them and get rid of bad shots. 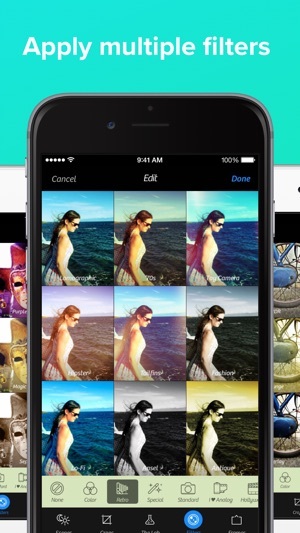 You save only the photos you’re satisfied with so that your camera roll stays neat and clean. Whether you want to show your results to your friends and family or the whole world, Camera+ has got you covered. Proudly share your photos on Facebook, Twitter, and Flickr. Or go the more personal route and email or message them from right within the app. Automatically sync your Camera+ photos between all of your devices. Shoot all day on your iPhone… and then edit at night on your iPad. If you didn’t line-up your shot perfectly when you took it, you can easily fix that with Camera+. And when you want to get a bit creative, we setup a bunch of popular crop sizes for you. 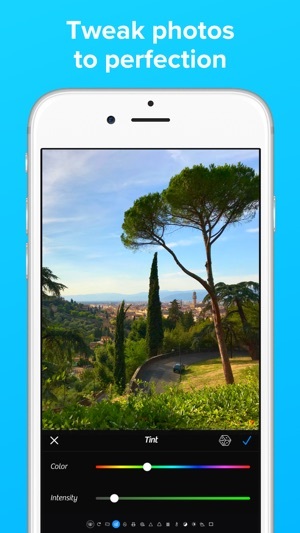 With a single tap, you can make your pics square, 4×6, 8×10, and more. With Camera+ you get several great border designs, from simple black and white borders to more gritty designs, you’ll be able to add wonderful finishing touches. Have some fun with your photos by putting captions on them. It’s a great way to really personalize your favorite shots. In this update we have added iOS 12 and the new iPhone XS and iPhone XS Max support. Create professional-looking photos with minimal effort, thanks to Camera+’s excellent manual controls for shooting, plus dozens of filters, frames, and tweaks to help perfect each shot. 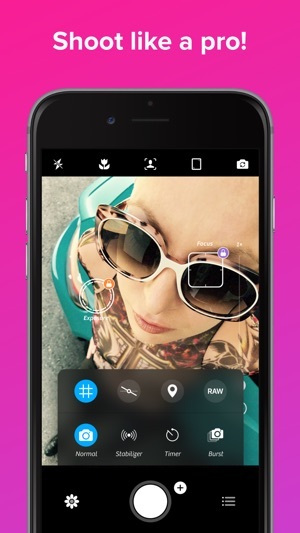 From adjusting your workflow to syncing your pictures to iCloud, Camera+’s features have been meticulously crafted, refined, and innovated throughout the years. I have been a customer since tap~tap~tap first started. I watched it get better and better. I don't know if the creators remember me but a few Years ago I wrote a manual. Basically I took their user manual which were in no specific order on line and printed them all. Then made dividers between the sections and designed a slick looking title cover. I took a few pictures and sent them to the creators. I only did this for myself because I love this app. I've probably this app to over 150 people and they became believers. Actually this type stuff I do for a living. I'm a marketing director for a medium sized firm and making a user manual was kind of fun. But it's obsolete now. The technology is so advanced that anything you do will be no good because of changes. This app has come a long way. For those who have read this, order this and if there's any charges for add ons buy them! You so t be sorry. 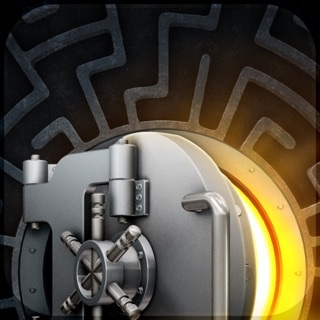 There is no one app better then this in the entire world. I commend the engineering photographic experts for their many hours of hard work. I hope that you all have achieved your rewards and payback time. Thanks a ton for your work. I am a professional photographer, and although I shoot with a Canon 50D during sessions with clients, I shoot my macro florals with my phone. As long as I get quality images from my phone, this is fine. I can't carry a huge camera around all day, so the iPhone, it is. I'm putting together all sorts of ideas with these florals, and soon they will be a huge part of my business. People often ask how to purchase them, so I feel very excited and encouraged. Anyway, before this app came along, I was using a clip-on lens. After awhile, clip-on lenses can start to cause damage to any phone, so I was really happy to discover a free app that shoots in macro. My only complaint: The images are sometimes strange looking. Hard to explain. They have a sort of false look to them. Too sharp yet oddly blotchy almost like a watercolor painting. I truly don't know how to articulate what I'm seeing. I manage to get rid of some of that in post processing, but do wish there was nothing to 'get rid of'. Okay one more complaint: Sometimes it's very hard to focus, and I find this frustrating. I don't mean to sound negative! It's a great, app. I'm grateful for it. Thanks!